Fan speed infinitely-variable down to stall speed (minimum speed where fan won't stop). Reducing fan speed not only reduces fan noise but also reduces battery drain. High-efficiency switching regulator does not generate waste heat that might interfere with telescope performance. Controller can deliver 1 Amp continuously (typically 8 fans) but actual Amps will not exceed that specified on your fan’s label. Protective circuitry prevents damage if a wiring fault should ever occur. Turning control knob fully counter-clockwise turns fans OFF and no current is drained from your battery. Turning control knob clockwise turns fans ON at minimum speed and minimal power is drained from your battery. Turning control knob further clockwise increases fan speed but battery drain is no higher than without Fan Controller. The Fan Speed Controller is warranted to the original purchaser for 5 years from the date of purchase. 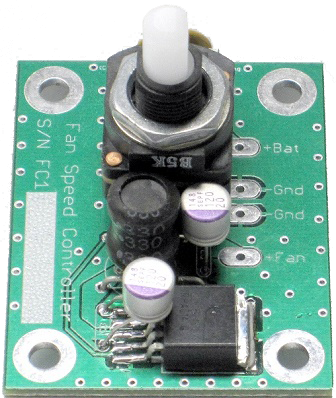 For detailed mounting and wiring information, please see the Fan Speed Controller owners manual. Typical installation is to solder your wires directly to circuit board. If you've never done this before see "Soldering is Easy" beginners guide to learn how easy it is to solder. For no-soldering installation, you may select Optional Wiring below and the Fan Controller will be prewired with Red and Black wires for power-in, and Yellow and Black wires for power-out to your fan. I ONLY SHIP TO USA OR APO ADDRESSES. I do not ship international because the Postal Service WILL NOT refund shipping or even tell my why a shipment was rejected by Customs (none of my products are restricted yet they sometimes reject it for no apparent reason). International customers are welcome to ship to a 3rd party in the USA who can then reship to you. IMPORTANT: I WILL BE ON VACATION UNTIL XXXXXXX. YOU MAY PLACE YOUR ORDER BUT I WILL NOT BE ABLE TO START BUILDING YOUR DEWBUSTER UNTIL I RETURN ON MAY 15TH. This form emails you a quote with instructions to place the order. You are under no obligation and may reply to the email with questions or request changes. Your information is kept confidential and will never be shared with any other parties. 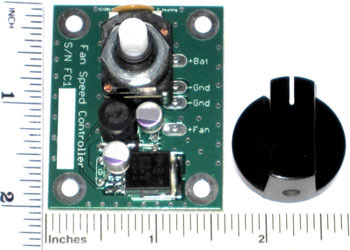 Fan Speed Controllers are built-to-order which typically takes about a week. Acknowledgement: Type yes to acknowledge. Sorry but I ONLY SHIP TO USA OR APO ADDRESSES. International customers may ship to a 3rd party with a USA address who can then reship to you. State: Please use 2-letter abbreviation. Zip Code: Enter only first 5 digits of Zip Code. E-mail_Address: Does NOT have to match PayPal Email. SPAM-CHECK: These boxes MUST BE LEFT BLANK. After clicking SEND EMAIL it will take about 15 seconds for screen to advance. by Ronald & Teresa Keating.